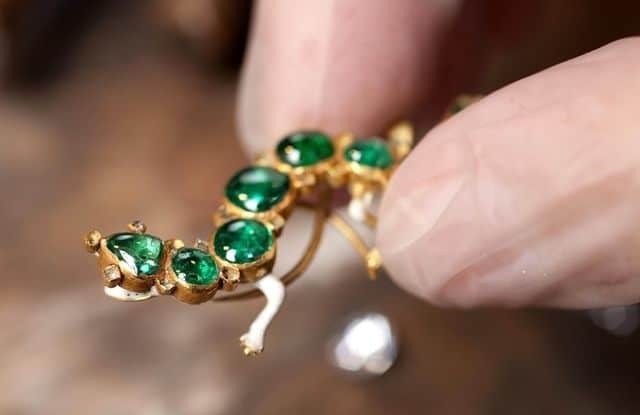 Just over one hundred years ago workmen digging in Cheapside unearthed what is now the largest cache of Elizabethan and early Stuart jewellery ever found. This diverse collection of jewellery has only just gone on display in its entirety for the first time since its discovery in 1912. Last week I visited the Museum of London to see this temporary exhibition for myself. Although I can appreciate the aesthetics and social significance of jewellery, I am not particularly interested in jewellery. For a number of reasons, however, I was still very keen to see the Cheapside Hoard exhibit during my last visit to London. Not only has this hoard been widely hyped as an internationally important collection of artefacts, I also enjoy seeing how curators create interesting exhibitions out of challenging collections of artefacts. On all levels the Cheapside exhibit did not disappoint. This is definitely an exhibition any visitor to London with even the slightest interest in that city’s past should not miss. The Cheapside Hoard was uncovered in 1912 by workmen during demolition work at a property in Cheapside, London. The property had belonged to the Worshipful Company of Goldsmiths for centuries. The collection of jewels and gemstones, placed in a wooden box, were buried beneath the cellar floor, sometime after 1640 but before the Great Fire of London in 1666. Although the building perished during the fire, the cellar and what lay beneath it, survived but was covered over with a brick floor during subsequent construction work. And there the hoard stayed until the early twentieth century; whoever buried it did not come back to claim it. 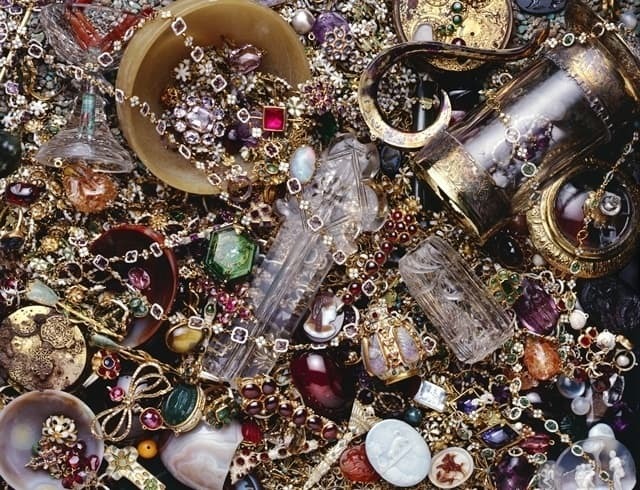 The hoard in its entirety represents the stock-in-trade of a working goldsmith: both finished and unfinished articles, loose gems and a variety of finished jewels, including chains, rings, and even Byzantine cameos. 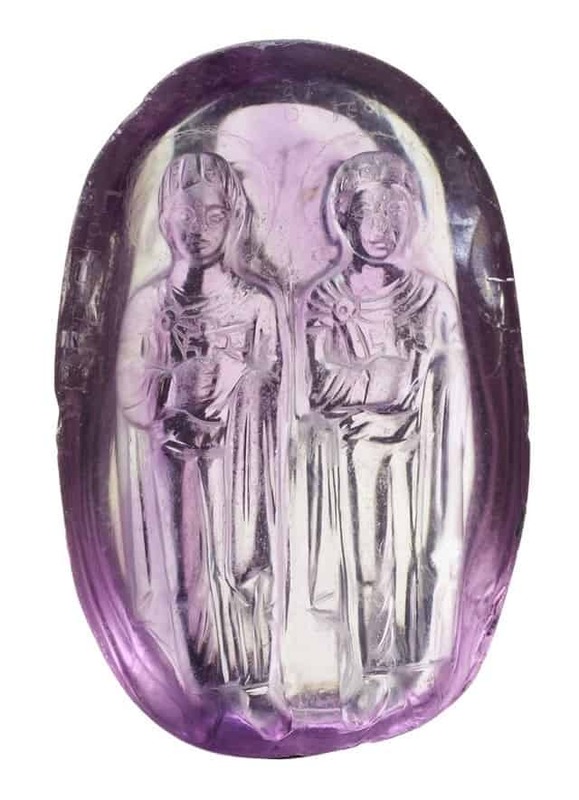 And it is the presence of the so-called ‘Stafford Intaglio, a cornelian lozenge shaped gen with an engraved heraldic badge of William Howard, Viscount Stafford, that provides the crucial information for dating the burial of the hoard. The Hoard has some exquisite examples of 16th and early 17th century jewellery. And with nearly 500 objects in the hoard, it is an incredibly diverse set of artefacts. The diverse range of objects is itself quite something to take in. Singling out a few of these to represent the collection is difficult if not impossible. But, as someone who loves detail in the miniature, I was already taken by the Salamander Brooch before even visiting the exhibition. Just look at the object being held between two fingers; it is a truly beautiful piece of craftsmanship. 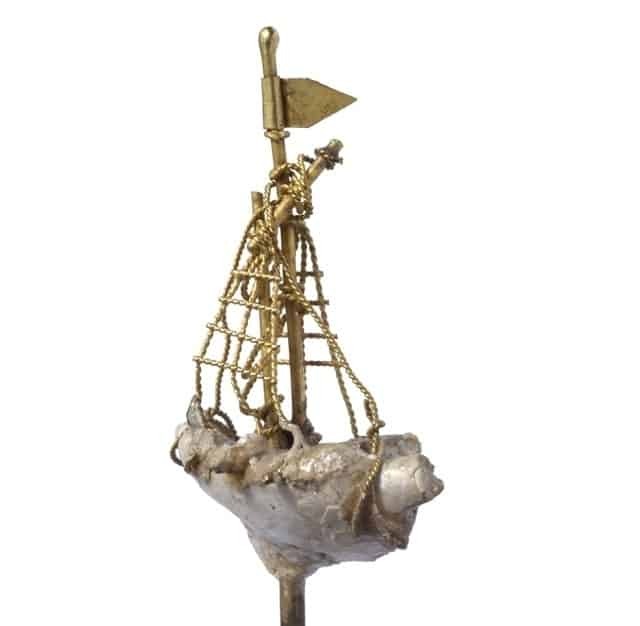 But, the piece that stole my heart, that had me returning to it again and again, was the Gold and Pearl Ship Pin. The Ship Pin and the Salamander Brooch really are tiny pieces, but the curators have done a number of things to help visitors see the size but also appreciate the minute detail. First, large and strong magnifying glasses have been provided to allow you to magnify the object (you can see these alongside a display case in the photograph of the exhibition gallery above). These are a wonderful aid and well worth it to get a closer look at some of the objects on display. As ever, there were the few selfish visitors who just clung to the magnifiers and wondered around the exhibition as if they owned them, denying other people a chance to have a closer look. Second, scattered around the exhibition are a number of video presentations in which some of the objects have been magnified to show the fine detail. 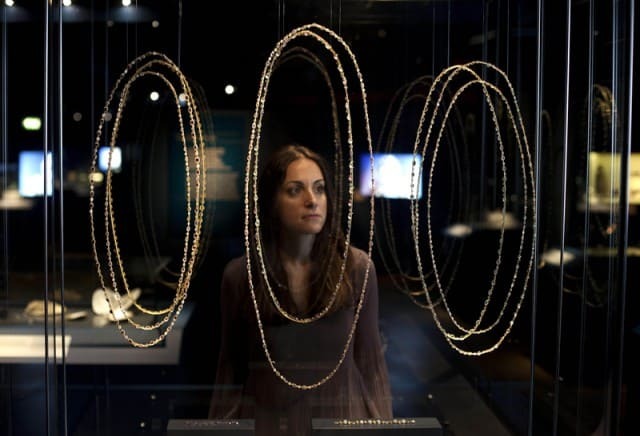 In some instances, the video presentation has been used to show how objects were made – as in the case of the pearl pendants (below). A gold and pearl pendant cage. © Museum of London. 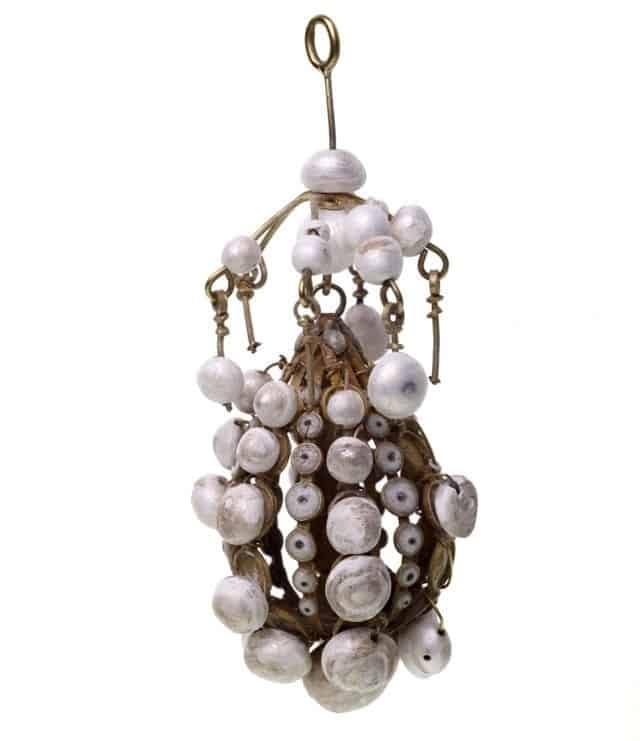 The hoard has a number of pearl pendants, that were probably worn as earrings or hair pendants. Sadly, the pearls in many have disintegrated – the conservators estimate some 1356 pearls have perished. Our appreciation of the pearl pendants hanging in a glass case is greatly enhanced by the computer generated presentation of the making of these pendants (only a few seconds over a minute long) and a display showing where the pearls would have come from and how thy were graded by Elizabethan jewellers. As exquisite as all of these objects are, this is not just an exhibition of fine jewellery beautifully displayed. The exhibition is in a gallery in the lower levels of the museum. Entering the exhibition is what I imagine entering bank vaults to look like. I am not sure if it was just an effect or the entrance really had to be made that secure (quite understandably), but as you pass through the high security turn-styles you immediately realise you are entering something special and valuable. 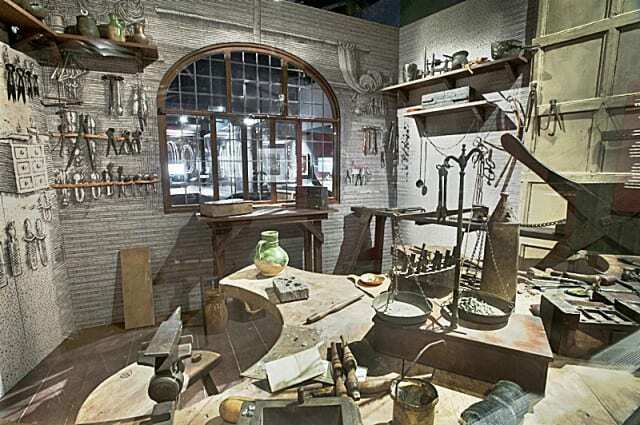 Before getting to the precious stuff visitors pass through a few preliminary display areas that do well in setting the scene of jewellery in Elizabethan England; from the trade in exotic materials to the reconstruction of a jeweller’s workshop. 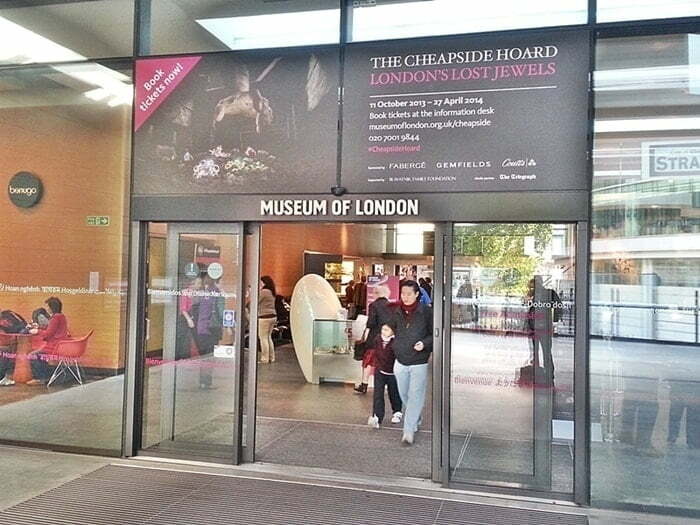 These displays provide an excellent introduction to the Cheapside Hoard itself. 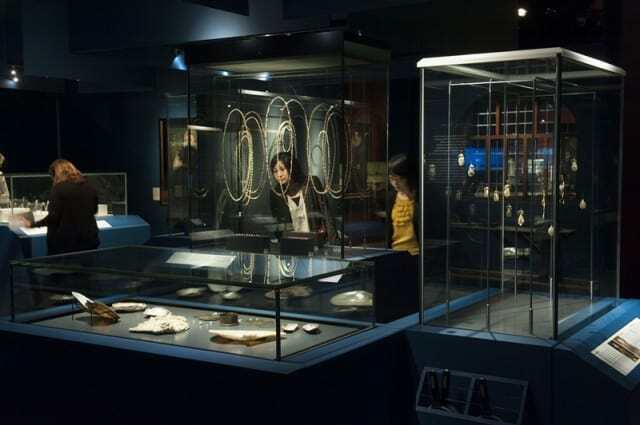 Where the introductory display spaces are well lit, the principal gallery is darker with exceptionally well lit cases displaying the jewellery in all its glory. As mentioned above, alongside the display cases are holders in which large magnifying glasses can be found. Grab one and take a closer look at the necklaces, to see the incredible detail of the enamelled foliate and floral links that make up the necklaces. Hung on the walls of the gallery are contemporary portraits that provide a wonderful visual record of how some of the jewels on display were worn. 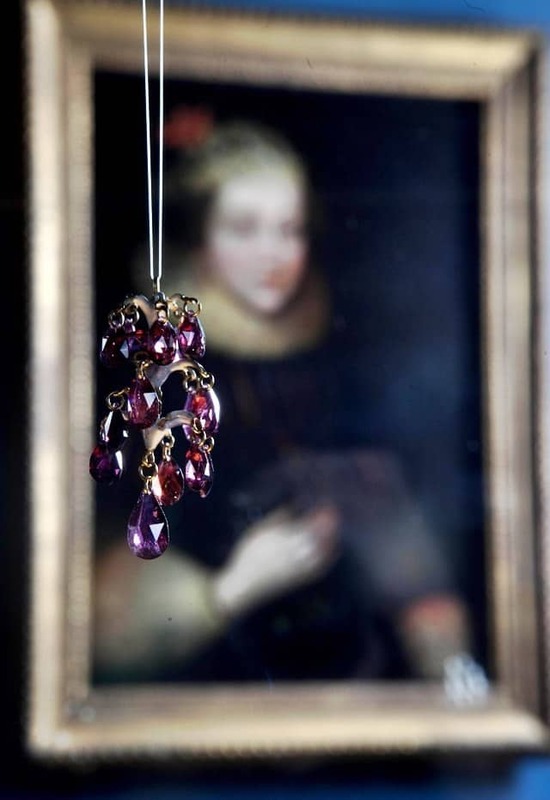 In the portrait from Elizabeth Wriothesley, on loan from the National Portrait Gallery, the Countess is wearing ruby or garnet earrings, just like those found in the hoard. Amongst the many display cases of the hoard are display cases that provide further information about various aspects of the jeweller trade or traditions and fashions of Elizabethan England, such as the trade in gems or clothing of the time. These do much to bring the wonderful pieces to life. What struck me the most about seeing the hoard as it is distributed around the many display cases was the variety of objects it included. With close to 500 individual pieces I suppose you do expect some variety, but the diversity of artefacts far exceeded my expectations. The hoard has a few timepieces, but the clock set in a Colombian emerald crystal really is something unique. According to scholars there is nothing from the time (circa 1600) to rival this piece. 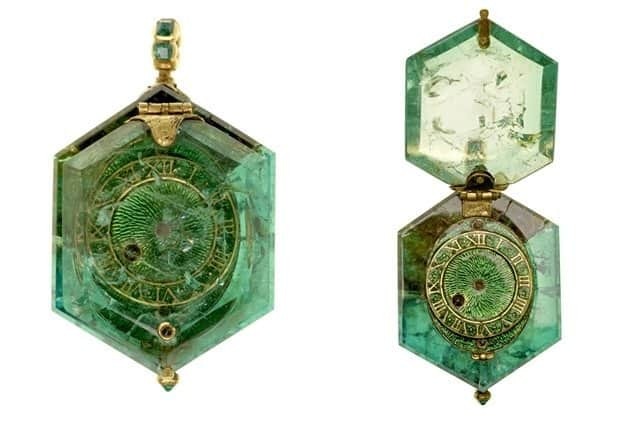 Contrast the green, Elizabethan timepiece with the amethyst cameo of Byzantine age, and you start to get some idea of the astounding array of objects in the Cheapside Hoard. As with all archaeological collections, there are questions we simply just do not know the answers to. Of course it would be interesting to know exactly when the Cheapside Hoard was buried, by whom and why, and certainly why they never returned to retrieve it. But it seems we may never know the answers to these questions. 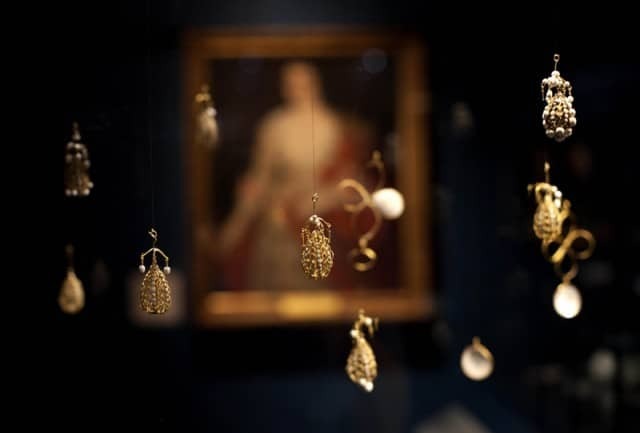 The exhibition is a testimony to what we do know about the hoard, the research it has engendered – revealing a lot about craftsmanship and wealth in 16th and early 17th century London – as well as the technical display skills of the staff of the Museum of London. If I lived in London, this is an exhibition I would definitely re-visit. Please note: The museum gave me a ticket to review this exhibition on ‘Archaeology travel’ – this has not influenced my review in any way.